While it's sad to think about our own death, we can never be truly hopeless because of Christ's Resurrection, Pope Francis said on All Souls Day yesterday at a cemetery outside of Rome, according to the Catholic News Agency. Traditionally, popes have gone to Rome's 19th century Campo Verano cemetery to celebrate Mass for the Feast of All Souls. 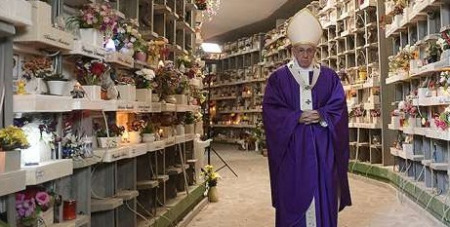 But this year Pope Francis celebrated the Mass at the Prima Porta Cemetery on the northern outskirts of Rome. After the Mass, he went to the grottoes beneath the Vatican for a moment of private prayer for the deceased popes. The cemetery was consecrated in 1941 and is considered to be a masterpiece of contemporary architecture.